A non-impact, full-body workout in water. Shallow water aerobics is a strength and aerobic exercise you can do in the water to prevent undue pressure on your joints. 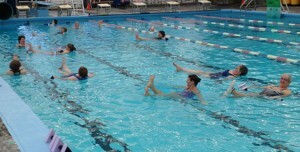 Power aerobics is a deep water class. You are going to love this workout-Try it!